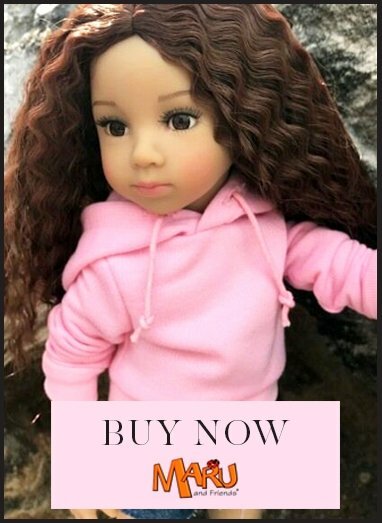 Brand Paola Reina/Every Girl Eye type Brown/ Closing Size 44cm/ 17" Hair Black/ Rooted Articulation 5 points Paola Reina was established in Spain in 1994 and has achieved worldwide success with its beautiful dolls. Each doll is unique and special in its own way. Paola Reina dolls are thoroughly European as not only are they made in Alicante in coastal eastern Spain, all their component parts are sourced from Europe. The Every Girl dolls are a new collection and are utterly gorgeous. They have a new body type allowing for movement in their arms. Their arms and legs are vinyl but within the cavity of the soft body is a 'skeleton' with a swivel mechanism at the shoulder. Therefore the arms can be moved out to 180 degrees from their shoulders, and also straight in front of them and hold the poses. This is truly a great feature of a soft bodied standing doll. They have soft cuddly bodies and are very gratifying to hold. They just say 'pick me up'! At 18" they are bigger than the Paola Reina Soy Tu and stand at the same height as the Gotz dolls, Kidz 'n' Cats and American Girl dolls, so are able to share many clothes with them. Andrea has African skin tone and rooted black hair. Her hair is layered and with plenty of body and shine to it. The fabric on her body tones very well with her vinyl. She has thick eyelashes on their upper eyelids which enhance her closing eyes. Her facepaint is very natural making her look particularly alive and the subtle scent of vanilla is very appealing, particularly to young children. Parents will be delighted to learn that the vinyl used in making the dolls complies with all the European regulations for quality and safety and does not include phthalates.